You may not be able to tell from the photographs, but Flat Stanley got along quite well with my little friend Haley. Which is a bit surprising because she is very assertive for a ten-year-old. Unfortunately, she doesn’t show up in the pictures. This is not because she’s camera shy––far from it––but because she was the one using the camera, as usual. Except, she is in a drawing I set on my laptop’s keyboard visible in this photograph to the left. She says that she really exists, in stark contrast to Flat Stanley who is only two-dimensional. She thinks imagination is fine, but with modern technology Flat Stanley should come zapping across the Internet fully animated. Despite his obvious limitations, Haley thinks we--but mainly she—was able to communicate fairly well with him. According to Haley, this is in spite of the fact Flat Stanley is visiting me—because what we writers do, when viewed by an outsider, is drab and boring. A few years ago when I was just beginning chapter nine of my young adult novel The Pigeon Catcher, Haley suddenly appeared in my story, unplanned by me. She has been in several of my other stories since then. If you wonder how she could appear out of nowhere, it is because unlike most writers I often do not know how the middle or end of my stories will turn out. To continue, when I first viewed her through the bedroom window as I mentally peered over the shoulder of her neighbor, Kevin, I saw her expressive obsidian eyes set in mahogany skin, surrounded by the halo of her wavy black hair. Haley says: A writer’s life is so boring! Write, write, write—or in Gene’s case—type, type, type—that’s all they do. Plus research. You wouldn’t believe the research. It is really nice having Flat Stanley visit. It actually got Gene (aka, E.A. Bundy) away from his computer for a few minutes. But I have to tell you, Flat Stanley needs a do-over. He should go on one of those reality TV shows and have a total makeover. He looks like he got time-warped away from some retro era. I thought when I first saw him that he was a joke. Then I decided maybe he was like those little gnome guys that people had in their yards years ago. You know, the ones that weirdoes kidnapped and tortured and sent ransom notes to the homeowners they stole those pathetic little plastic people from. No such luck. Nobody wanted to ransom Flat Stanley and now I know why. The guy’s pathetic—or he was when he first got here. I was able to help him quite a lot! When Gene first showed him to me, however, I laughed and said, “Yeah, right!” But, to be fair, he does kind of grow on you. Sorry, guys! Sometimes I say stuff before I think. Well, I decided to show our little visitor around while Gene typed away on his computer keys. If it wasn’t for me, Flat Stanley would have seen nothing at all. He would have just sat there looking at the laptop screen. Gene’s not so bad once you get to know him. You just have to trick him into going outside--without his laptop! Anyway, poor little Flat Stanley would have been content to just sit there and watch a novel slowly develop—and I mean very slowly—unfolding letter-by-letter to create the words on the screen. So…I took him out around our property. He got to ride on Strider, Gene’s humongous dog. He’s half Newfoundland and half chocolate lab—big as a Newfie, but dark-chocolaty brown, with amber eyes. Strider took to Stanley right away, but he’s like that. He loves just about everybody, even if they are two-dimensional and two legged. None of that seems to matter to Strider. 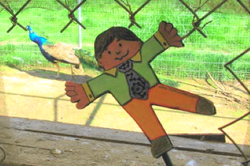 Anyway, Strider and I took Flat Stanley over to the peafowl aviary. We have some of the regular blue and green peafowls and a couple pure whites. Actually, Flat Stanley didn’t seem too impressed. He paid more attention to the domestic mallard duck that wanders loose than he did to the big old peacock strutting his stuff. 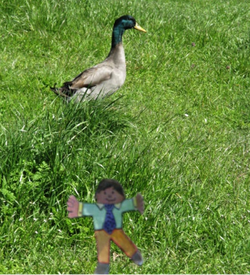 The duck paid a lot of attention to Flat Stanley, as well. Don't tell the other birds, but the pure white peafowls are my favorites. It can be just our secret, right? We don't want to hurt their feelings. Most people don't know this but peafowl are actually quite sensitive. Not like Flat Stanley. You can say anything to that little guy and it doesn't seem to bother him. That smile just never leaves his face. Did you notice that? So, as you can probably see, the main difference between a Rouen and a Mallard is their size. And the mallards can fly all over the place. Our drake stays pretty much on the ground. He can't run very fast, either, but Strider protects him as long as he stays inside the fence. Flat Stanley didn’t utter a peep when the drake took the little guy’s foot in his bill and chomped up and down like he thought Flat Stanley might taste good. That old bird gave up pretty fast, though, and I was able to smooth out the soggy mangled foot for that muted little cutout fellow. Then I took Flat Stanley over to the racing homer loft. Through the years, Gene has selectively bred them until there are lots of pure whites; just like my friend Kevin, from The Pigeon Catcher story. You probably know Kevin, right? Anyway, those white racers make quite a sight up against the blue sky when they are flying. But once again, Flat Stanley didn’t seem too impressed. Next, Strider and I took him over to a pond that is not too far away. I don't think the pond has a name. We just call it "the pond." Strider has to be on a leash when we leave home, but he loves to go on these little trips. There were a couple of those Canada Geese when we arrived. Occasionally, they drop in at the pond this time of year. They didn’t seem to care for Flat Stanley too much. The geese are used to seeing Strider and me because we walk around there occasionally. They honked at the little guy, though. He put up a good front—acting as if he wasn’t scared and all that. The geese honked more and more and finally took to the air, circling around, honking who knows what kinds of things at us. Strider paid them no heed and Flat Stanley tried to look as calm as the big dog, but I could tell it was just a bluff. Flat Stanley Goes in a Boat! Strider loves to go swimming in the pond and he gets to be off his leash once we get there. 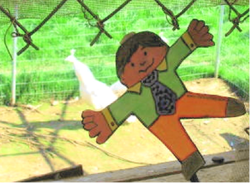 I asked Flat Stanley if he wanted to go out in the rowboat somebody left by the pond. I think he was too chicken to say no. Anyway, I put him in the bow of the boat where he wouldn’t get hit with an oar. He tried at first not to look too worried, but I could tell he was searching around for a life preserver. Luckily, there were already two in the boat because that’s the law around here, one safety vest per person. Of course, Strider just swims everywhere and never uses any safety devices, but he’s a dog. Look closely and you’ll see Strider in the water on the left side. It was during our pond adventure that Flat Stanley and I really connected. A gust of wind came up and blew him toward the stern. He would have gone overboard for sure and Strider was far enough away, I doubt he could have retrieved the little guy in time. Luckily, I let go of both oars and caught Flat Stanley as he whisked past me. It was a great save if I do say so myself! I could feel the little guy shivering. I thought I could even hear his teeth chattering. Anyway, we were inseparable after that. I’ll even be sad to see the little guy leave— So long for now, from Haley. To order a copy of The Pigeon Catcher, go to the store via the navigation bar.